I rolled back into my bed at the Crowne Plaza in Denver and silently wondered, "How bad is this going to be?" The answer came soon enough. Two of my kids -- the indefatigable 11-year-old and the high-energy 13-year-old -- were uninfected. But my 15-year-old? Oh, he had it. He had it bad. "Dad," he groaned. "I need to see a doctor." Aren never asks for a doctor. He's a "walk-it-off" kinda guy. I knew it was serious. If I could only get out of bed. As it turns out, we were in the ideal place to heal. Denver, with its museums and hotels that have some experience catering to sick guests in the dead of winter, is a path to wellness. And Boulder, Colo., the next stop on our journey, is the cure. With apothecaries, health food stores and attractions that won't strain you, we managed to get ourselves back on the road. The flu is awful this year, the worst it's been in a while, according to the CDC. In the first week of January, out of every 100,000 hospitalizations, almost 23 were for the flu. Also, the vaccine is minimally effective, meaning that there's almost no way to avoid it. Aren tested positive for a full-blown case of H3N2, and a doctor wrote him a prescription for antinausea medication and Tamiflu. Then we checked into the Crawford Hotel across town. Much to my relief, hotels in Denver seem to specialize in catering to ill guests. At the Crawford and our next hotel, the Maven, the staff stocked our room with extra bottles of water, soup mixes and more blankets and pillows. That allowed me to rest as well, since I was competing with my son for the title of Sickest Hotel Guest. Both properties have ample food opportunities right downstairs, from the tasty Mexican food at the Maven to an array of restaurants at Denver's Union Station on the ground floor of the Crawford, which made it possible for me to stay in bed most of the day. Our itinerary needed to be adjusted. We were supposed to hop on the Winter Park Express train and spend the weekend skiing, but that wasn't happening. Instead, I slept, buffeted from side to side by the fevered chills of H3N2. The Denver Museum of Nature & Science seemed like the perfect place to keep them occupied. I found a nice chair in a dark corner and continued napping while they checked out the dioramas of Colorado animals, dinosaur exhibits and watched a movie about flying animals. I'd like to thank Ibuprofen for making that visit possible. It's a short, half-hour drive from Denver to Boulder. Lucky for us, we'd rented a Nissan SUV when we landed at the Denver airport, with plenty of room for our belongings that allowed Aren to recline in the back and get more rest. The car even came with a rack for extra storage, which we probably wouldn't be needing since we'd be doing more sleeping than skiing. I should note that it's probably not the best idea to operate a vehicle when you're heavily medicated. I hope Hertz will forgive me for doing that, but I inspected the car after I checked into the Embassy Suites in Boulder, and not a scratch, I promise. Boulder is all about wellness. In town, we discovered several apothecaries that emphasize natural remedies, including Six Persimmons and Rebecca's Herbal Apothecary. 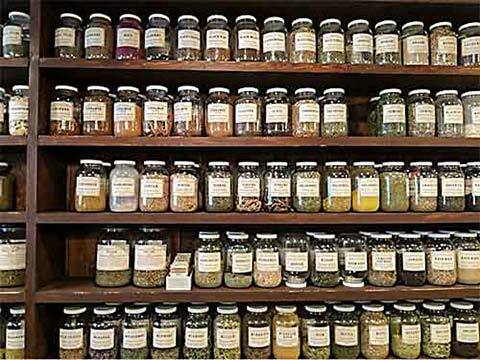 These look like something straight out of a Harry Potter movie, with jars of elixirs and tea lining the shelves. At Rebecca's a helpful pharmacist recommended their home-blended Tummy Tea, a mix of fennel, marshmallow, peppermint, chamomile and licorice. The flu can do a number on your stomach, and Rebecca's tea helped. The Embassy Suites also stocked our refrigerator with an elixir called "The Cure," which helped Aren get back on his feet. For lunch, we headed over to the Rayback Collective, a cool, only-in-Boulder kind of venue with food trucks and a bar that serves outstanding kombucha. The fermented bubbly tea is said to have healing properties, but is also a favorite of my middle son, Iden, who continued to be unaffected by the flu. The food trucks also offered a terrific lunch -- sandwiches made with sauteed vegetables for the boys and mac and cheese for my daughter. Boulder is a truly unique place among American cities, but if you're into healthy living, you'll call it home. Within three blocks of the Embassy Suites, we found a Natural Grocers, Whole Foods, Trader Joe's and an REI. "Hipster nirvana," said my oldest son, who by now was feeling much better. If you venture a little farther, you can find my favorite place for a bite in Boulder, Thrive, which specializes in raw organic vegan food. Oh, I know, that's almost a cliche, but the food is really good. I ordered a taco salad and had to fight my kids for it. After a few days of healthy living, we were feeling better -- much better. And that meant there was only one thing to do: head back up to the slopes. 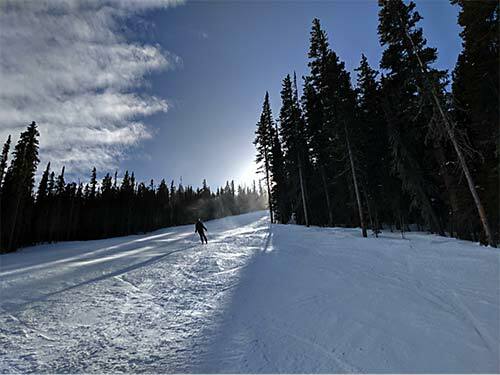 One of Boulder's best-kept secrets is Eldora, a ski resort only half an hour's drive from the center of town. On the day Aren took his last dose of Tamiflu, he said he was ready to get back in his ski boots. Of course, it could have something to do with a fresh layer of powder that had fallen overnight. Eldora is our kind of mountain. It's unpretentious, pretty, but offers plenty of challenging runs, including several double black diamonds (rated "most difficult"). There's a high-speed six-pack chairlift that whisks you to the summit in just a few minutes, allowing you to spend most of your time on the slopes. And the views -- ah, the views! -- are pretty astounding. The resort sits right on the continental divide, with views of the Rockies that most visitors to Colorado don't get to see. Best of all, the amenities of Boulder are only a short drive away, and you don't have to deal with the traffic of I-70. Maybe there's a silver lining to getting sick, at least here. The flu slowed us down and made us appreciate Denver and Boulder for the little things, like the bowl of soup thoughtfully delivered to our hotel room or the tea blended especially for us -- or the out-of-the-way ski resort that we absolutely, positively will have to come back to soon. My advice to anyone taking this kind of trip? Consider the flu vaccine if you go. And if you don't, make sure you visit Colorado.